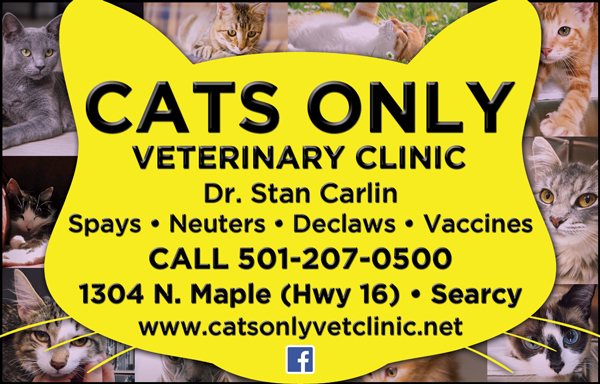 Cats Only Veterinary Clinic is owned and operated by Dr. Stan Carlin, DVM. Dr. Carlin has been a veterinarian for over 30 years. He and his loving staff offer vaccines, blood tests, Feline medical and surgical services with special pricing on cat spays, neuters, and declaws. Boarding is also available. Regular office hours are Monday - Thursday from 7:30AM-5:30PM, and Fridays from Noon-5PM. Appointments are preferred and begin at 9:30AM, Monday-Thursday but walk ins are always welcome. Everyone at Cats Only loves cats and look forward to meeting your furry family! Please give them a call at 501-207-0500 to schedule or come by 1304 N Maple St (Hwy 16N). Visit Cats Only Veterinary Clinic online.